Cremeux was established in April 2006 by Mr. Vincent Dias at his home in St. Cruz, Goa. Mr. Dias is a pastry chef by profession having graduated from the prestigious Oberoi Center of Learning & Development in New Delhi and worked in numerous five star properties globally, including the Oberoi Hotel in Mumbai & Udaivilas Udaipur, The Four Seasons in Maldives, The Fairmont in Dubai. Mr. Vincent has numerous accolades to his name – with several Chef of the year awards. Since inception, Cremeux has had a very simple philosophy – excellent products are made from the best ingredients and time-honored methods of production. This philosophy is followed diligently in all the products made by Cremeux – whether it is cakes, pizzas, sandwiches, bread, toast or any of the other offerings. The products are prepared with carefully chosen ingredients by qualified personnel in a hygienic production center and distributed fresh to all our customers and stores. We not only produce daily, we produce hourly. We are fixated by quality and freshness of our products and to ensure that these stringent norms are met – the company has invested in a production center at Corlim Industrial estate. The production center is equipped with state of the art imported equipment to meet our own high standards in a consistent manner and staffed with over 50 trained and qualified staff. The production center works 24 hours a day to ensure that products are always freshly delivered to the customer – the way bakery products are at their best! We like to produce Cremeux quality products to meet your needs. We supply numerous hotels & retail chains with our products daily and our past & present customers include the Vivanta by Taj, Grand Hyatt, Deltin Hotels, Big Bazaar, Magsons and many more. In addition, we produce lunch or snack boxes for meetings or larger events, gift hampers/chocolate boxes for your company or customized cakes for special occasions. Located at a convenient location to make sure that we can meet the need of every neighborhood. This store typically has our entire range of pastries, cakes, packed sandwiches, snacks and can take orders for all your occasions. This format is either company owned or run by our trusted Franchisee. Located at key locations around Goa. This outlet has the entire range of Bakery selection and freshly prepares a range of Pizzas, Flatbreads & other products. The café is also set up to take orders by phone and deliver directly to your home. Located at prominent locations in the city. This outlet provides our widest range of products and serves it fresh in an exquisite setting. The café also delivers and is open for private party bookings. We sell many products to your local retail store and also supply products through our online website. In all cases, we make sure that we stand by our products – Cremeux quality, freshly prepared. 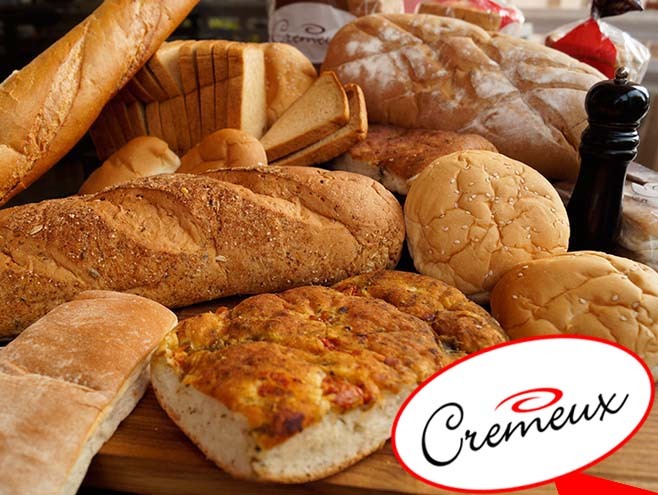 Whether it is sliced bread, Khari, Rusk, Jeera butter or cookies, Cremeux stands for quality products, always fresh! Finally, We at Team Cremeux would like to thank you for making us a success. We take feedback seriously, so please email or contact us with any ideas, experiences or issues you might have so that we can continue serving you in the future. © 2015 All rights reserved. Powered by Cremeux Goa.